I had lots of positive feedback and a few questions about my last blog on using accessories to pull an outfit together so I thought I’d expand on this theme further. This blog will provide you with a simple formula for putting together stylish, interesting outfits. It boils down to the power of three. This is an understanding that things that come in threes are more satisfying, more effective, and/or more memorable, than other numbers of things. There’s even a Latin phrase “omne trium perfectum” (everything that comes in threes is perfect, or, every set of three is complete) which conveys the same idea as the rule of three. So how does this work when putting an outfit together? 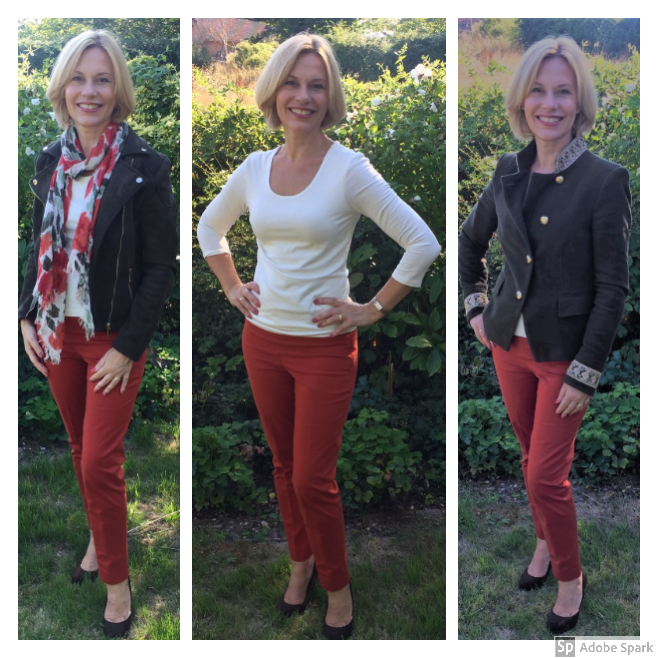 Lots of women’s go-to for everyday wear is a plain top and a pair of trousers/ jeans. This is simple, practical … and a bit boring. Take a look at me in the centre photo. How do I look? Not terrible for sure, but pretty uninspiring. When I add the third colour, in this case the olive green, can you see how the outfit becomes altogether more interesting and less “uniform”? Depending on your style personality, you may want to wear more than three colours, that’s fine, but just beware of creating visual overload. As well as wearing three colours, wearing three different elements will make your outfits much more stylish. Here’s a simple formula: basic piece(s) + interest piece(s) + statement piece. An interesting, cohesive outfit will generally contain one or more basic and interest pieces and usually just one statement piece (to avoid things looking too “busy”). Here are three variations on an outfit to demonstrate how this works in practice. Basic piece(s). This will normally be a plain item in a neutral colour. In these pictures it’s the white tee. Interest piece(s). An item in a more interesting cut, colour or with a relatively subtle print. In all these pictures it’s the trousers (distinctive colour) but in picture (1) the biker jacket with its zip detailing acts as a second interest piece. Statement piece. This is an eye catching item which will generally have some pattern and/or texture. In picture (1) it’s the patterned scarf but in picture (3) it’s the unusual jacket with the gold braiding and buttons. (I’ve left off the scarf to avoid creating two statement pieces which would fight each other for attention). A statement piece doesn’t have to be an item of clothing, it will often be a bold piece of jewellery, or a detailed and/or colourful handbag or shoes etc. You don’t have to adhere to the “power of three” to create attractive stylish outfits but in my experience it’s a great starting point. We are all individuals though and the most important thing is that whatever we wear makes us feel confident and attractive and works for our personality and lifestyle. This entry was posted in Blog and tagged accent colours, accessories, clothes, personal style, power of three, style personality. Bookmark the permalink.